A digital certificate stolen from Sony Pictures under the recent high-profile cyber attack has been used to sign malware, according to a report from Kaspersky Lab. 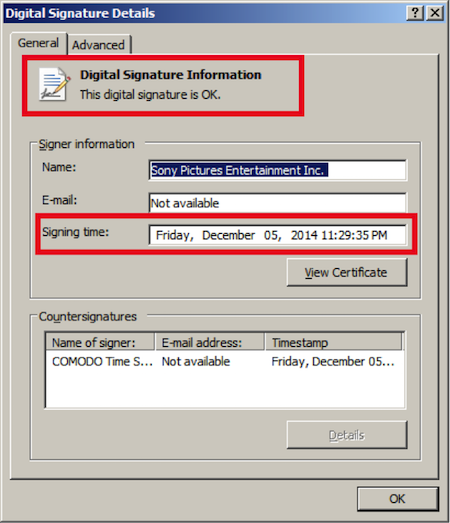 Ironically, the malware sample found digitally signed by the legitimate certificate from Sony was a sample of “Destover”, the destructive malware family that was reportedly used against Sony in the recent attack that resulted in troves of stolen corporate and personal data being leaked, along with the destruction data on corporate PCs. Sony’s digital certificates, which were leaked by the attackers could be used to sign other malware samples and used in other attacks, but in this case it may not have been actually used by someone with malicious intent. However, CSO's Steve Regan has pointed out that the malware sample, which was uploaded to Malwr, was a joke between researchers. The distrubting part, as Ragan reminded, is that after knowing its digital certificates had been obtained by attackers, Sony had not yet successfully revoked the known stolen certificates. So while this incident may be a joke, the risk of Sony's certificates being used in malware for real attacks is a reality. According to Kaspersky Lab, it appears as though the new sample was signed on December 5, 2014 and it virtually the same as a previously observed non-signed file. Kaspersky said that stolen digital certificate was reported to COMODO and Digicert, which should be blacklisted shortly. *Updated with additional information on sample thought to be a joke between researchers.